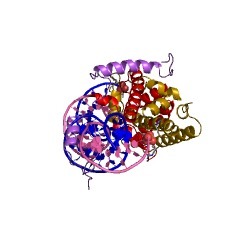 Diverse DNA binding proteins are known to bind the CCAAT box, a common cis- acting element found in the promoter and enhancer regions of a large number of genes in eukaryotes. Amongst these proteins is one known as the CCAAT-binding factor (CBF) or nuclear transcription factor Y (NF-Y) [(PUBMED:1549471)]. CBF is a heteromeric transcription factor that consists of two different components both needed for DNA-binding. The HAP protein complex of yeast binds to the upstream activation site of cytochrome C iso-1 gene (CYC1) as well as other genes involved in mitochondrial electron transport and activates their expression. 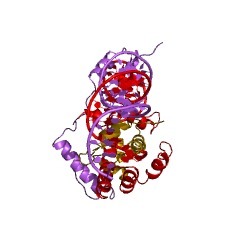 It also recognises the sequence CCAAT and is structurally and evolutionary related to CBF. The first subunit of CBF is known as CBF-A or NF-YB in vertebrates, and HAP3 in budding yeast. The second subunit is known as CBF-B or NF-YA in vertebrates and HAP2 in budding yeast. It is a protein of 265 to 350 amino-acid residues which contains a highly conserved region of about 60 residues. This region, called the 'essential core' [(PUBMED:1899284)], seems to consist of two subdomains: an N-terminal subunit-association domain and a C-terminal DNA recognition domain. This entry represents the NF-YA subunit. There are 2697 CBF domains in 2695 proteins in SMART's nrdb database. Taxonomic distribution of proteins containing CBF domain. This tree includes only several representative species. The complete taxonomic breakdown of all proteins with CBF domain is also avaliable. Click on the protein counts, or double click on taxonomic names to display all proteins containing CBF domain in the selected taxonomic class. Evolutionary variation of the CCAAT-binding transcription factor NF-Y. NF-Y is a CCAAT-specific transcription factor thought to be involved in the regulation of a variety of eukaryotic genes. It shows a striking sequence similarity with the yeast factor HAP2/3. In an attempt to trace back its evolutionary history, we succeeded in isolating NF-Y cDNA clones from a plant and from several species of vertebrates. The patterns of sequence conservation delineate potential functional domains: A central, highly conserved, domain likely responsible for DNA-binding and subunit interaction; more evolutionarily flexible flanking regions, in which variability is clustered, individualizing conserved glutamine or acidic amino-acids putatively involved in protein-protein contacts. Biochemical analysis of the B subunit of the heteromeric CCAAT-binding factor. A DNA-binding domain and a subunit interaction domain are specified by two separate segments. CCAAT-binding factors A (CBF-A) and B (CBF-B) are two subunits of the heteromeric CCAAT-binding factor. Portions of CBF-A and CBF-B have a high degree of amino acid sequence identity to segments of the HAP3 and HAP2 subunits of a yeast multimeric transcription factor. We show here that the subunits of CBF interact with each other in the absence of DNA binding. This interaction was revealed by cross-linking and coimmunoprecipitation studies. Both the DNA binding and subunit interaction functions of CBF-B have been examined by mutational analysis. A segment of 83 amino acids from residues 252 to 334, which corresponds to the evolutionarily conserved portion of CBF-B, is necessary and sufficient for CBF-A-dependent DNA binding. Carboxyl-terminal deletions of this segment (or mutations in arginine residues in this carboxyl-terminal part) abolish DNA binding, but do not alter subunit interactions between CBF-A and CBF-B. Mutations in hydrophobic amino acids within the amino-terminal part of the evolutionarily conserved sequence at positions 252-334 result in loss of both DNA binding and subunit interaction activities. Our results indicate that the evolutionarily conserved segment of CBF-B contains both DNA-binding and subunit interaction domains and that the integrity of both domains is essential for DNA binding. Purification and molecular cloning of the "A" chain of a rat heteromeric CCAAT-binding protein. Sequence identity with the yeast HAP3 transcription factor. 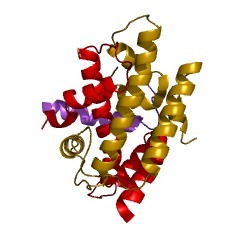 CCAAT-binding factor (CBF) is a heteromeric mammalian transcription factor which binds to sequences containing a CCAAT motif in a number of promoters such as those for type I collagen, albumin, MHC Class II, beta-actin, and others. It consists of two different components that are both needed for DNA binding. We have purified the "A" chain of CBF to apparent homogeneity by sequence-specific DNA affinity chromatography followed by Mono S and Mono Q ion-exchange chromatography and obtained the amino acid sequences of tryptic peptides of this polypeptide. Amino acid sequences of two of these tryptic peptides were used to synthesize oligonucleotide primers. The primers served to obtain a small cDNA by the polymerase chain reaction method, which was then further used to obtain larger cDNA clones. DNA sequence analysis of a representative cDNA clone revealed the presence of an open reading frame of 207 amino acids coding for a putative polypeptide of 25 kDa. Transcription of these cDNAs in vitro followed by translation in a reticulocyte lysate produced a polypeptide that migrated on sodium dodecyl sulfate-polyacrylamide gel electrophoresis with the same mobility as the native A chain. The deduced amino acid sequence of the A chain showed a remarkable identity over a length of 90-amino acid residues with a sequence of the Hap3 polypeptide, a component of a heteromeric multisubunit yeast transcription factor. This information is based on mapping of SMART genomic protein database to KEGG orthologous groups. Percentage points are related to the number of proteins with CBF domain which could be assigned to a KEGG orthologous group, and not all proteins containing CBF domain. Please note that proteins can be included in multiple pathways, ie. the numbers above will not always add up to 100%.